What does The Vegan Mafia Shop specialise in selling? We sell vegan products that teach others about the healing powers of healthy foods, and why they’re such a better choice than eating meat and dairy. For example, tomatoes are known to kill cancer cells; broccoli detoxifies the liver and blood, and so on. We decided to do a fun twist on our healthy eating message, by using fruits and vegetables to make up a Mafia family. They kill off disease and promote a plant-based diet, thus saving both animals and humans. Our t-shirts, posters, mugs, stickers, and hats all share the Vegan Mafia message. Where is The Vegan Mafia Shop based? Our design shop is located in Grand Prairie, Texas. Our printing is done at our California location. Do you only sell locally, or do you ship worldwide? We currently sell on-line through our Etsy Shop. We ship throughout the United States and most countries. What inspired you to create a business that solely focuses on vegan products? Fourteen years ago, we became vegans. You can read our story here. After many years of eating a plant-based diet, we saw our health improve dramatically. It wasn’t until this year that we decided to make and sell vegan products that highlights what food does for the human body. We are a close-knit family of four who encourage each another in a range of ways, and we also love watching movies, especially gangster ones! So, the concept of using fruits and vegetable as a mob family seemed fun and interesting; therefore, the Vegan Mafia was born. Very easy. All our products are vegan, and they're organic whenever possible. We are eco-friendly: we use organic, recycled or sustainable materials; our inks are water-based pigments. Our shipping containers are either 100% recyclable or fully biodegradable. For someone who hasn't purchased your products before and is indecisive about what to buy, is there a particularly popular design in the mugs, posters or t-shirts? 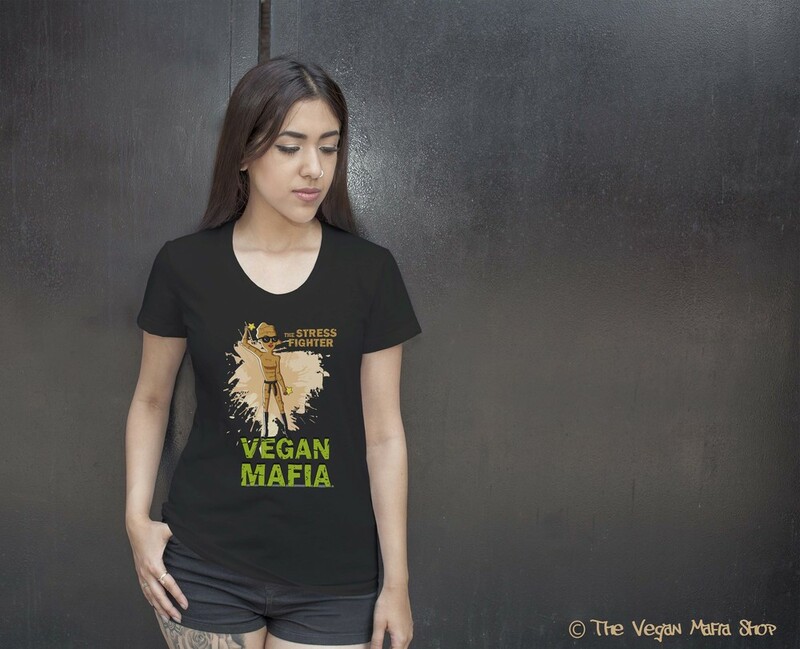 We love them all, and so do our customers, but most first-timers seem to favor The Vegan Mafia original in t-shirts and posters, which is pictured above. Another one of our popular designs is Vegan 4 Life, which you can see below. Is The Vegan Mafia Shop owned by, or in partnership with, another company that tests on animals or sells non-vegan products? We are a family owned business and we will never knowingly partner with any company that tests on animals or with any that sells non-vegan products. Tell me a bit about yourself before you launched The Vegan Mafia Shop? We’ve always been in the business of creating. From telling stories to designing art, and even making movies. The Vegan Mafia Shop is an extension of everything we love to do creatively, combined with our passion for veganism. What is your vision for the future of The Vegan Mafia Shop? We want The Vegan Mafia Shop to continue to spread the vegan message across the world. It is our hope that by encouraging people to eat a plant-based diet, we discourage animal cruelty, heal the planet, and ultimately, save lives.